Here's the after...before the before...with me? While painting the door outside I noticed how orange my foyer looked. It may have been due to the stain on the door but I hate to mess with the inside of the doors just yet. The original color was Tobacco Road. It is a bit on the golden side. Up against those doors it took on a orangie tint. Not the color Im going for now. For those of you wanting to know the color. Sorry,I cant help you this time because I made up my own mixture. I could not justify spending money on paint when I had gallons on hand. So I made up my own by adding a bit of this and that and came up with ....this! I find it did help tone down the doors a bit. 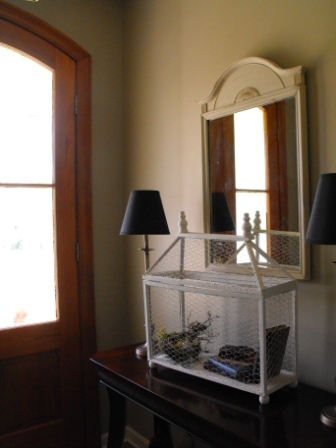 Not sure if this mirror and cage will stay past tommorow but I needed to stage it up a bit for you. Im having a few friends over Monday evening so I needed something fast. I shopped the house and used my good ole standbys. 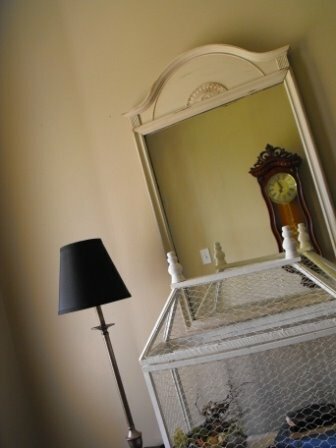 This basket I adopted from my sisters garage sale. Not bad for a room makeover that didnt cost a dime. Just move a few things around and shop your house and there you go! The new color looks great! The door did look quite orange-y up against the old color. Paint is paint.. it comes and goes. Yet the wrong color always sticks out like a sore thumb. I send my love and enjoy this eve. I am a repeat painter myself. Sometimes you just don't know how a color will effect you until after it's on and you've lived with it. 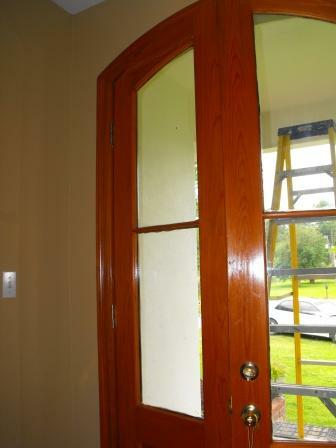 The new paint definitely made the stain on the doors look less orange. Now don't kill yourself getting ready for that company tonight. You won't feel well by the time they get there. Thanks for the comment on the blog. 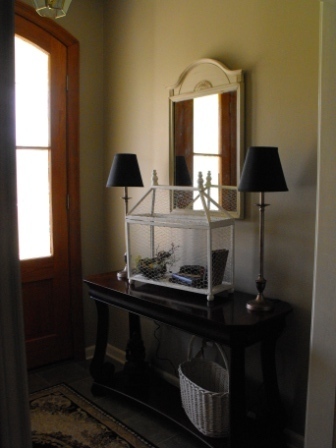 I've been checking out your blog too and love all your decorating ideas and tips. I'm going to continue to follow your blog. 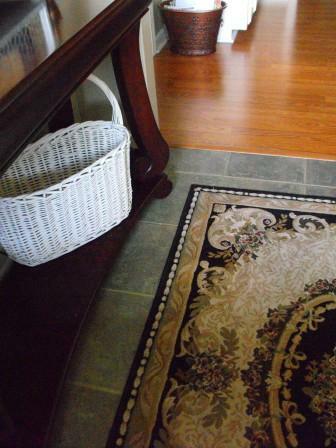 Your "new" foyer looks great! Love the table arrangements too! :) I really hope that you're feeling better soon!! I can't believe you were painting with a mouth full of stitches, girl are you crazy? *smiles* Looks fab though, of course anything you do looks great. I can't get a thing done around here between work, kids, pets *sigh* And there you are all stitched up and decorating *smiles* Have fun tonight at your par-tay! 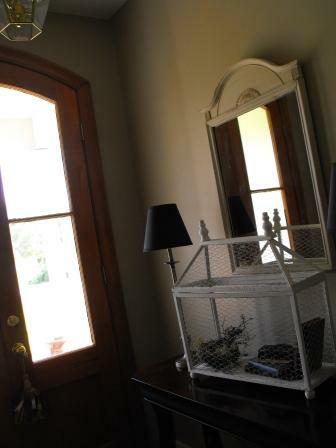 Your foyer looks terrific & I hope you're feeling better soon. It looks great! Hope you are feelin' better very soon! girlie. the best think about paint is if you don't like....then you can change it. Hope you feel much better soon, and that your party goes well. Foyer looks great! Hope you are feeling better and will be praying you will be feeling good when your guests arrive. looking good.....take it easy, girl. Oh, I love the color!!! Beautiful! Can't wait till tonight. I am home waiting on the repair man, Camo Man said I have to tell them to rip it all up and replace. You no how I hate drama,(even if it is my money) I am about to throw up... I feel the IBS..Why Sue am I like this??? TELL ME WHY??? 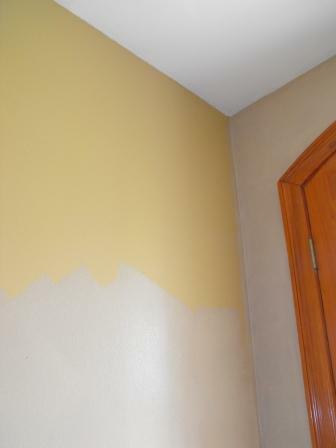 Love your new wall color and how clever of you to use what you have. I've done that before! I love how everything is coming together. Sorry you're still hurting, Susie! Poor one! Just know you have better days ahead! It looks awesome! However, you have no idea how badly I want to know the "name" of that paint you designed! Looks great! Glad you're feeling better! You are way braver than I am -- I don't think I'd ever mix anything and then put it on the wall. Love the new paint job and shopping the house for cute accessories! Hope you are feeling better soon! I've mixed paint like that too...too bad when someone loves it, huh? Looks like it's going to be gorgeous! Take some more pics when you get it all back together, can't tell the color too well. Hope you feel better soon, friend! That's lovely!!! 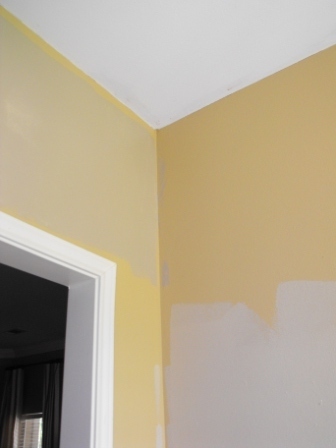 I am working on a painting project as well (my masterbedroom). I hope you feel better soon! Susie, the foyer looks fabulous,and I love the new wall color, but I think you should be in bed, girl! Get some rest and feel better soon. Looks great....hope your party went well!